I hate when I get blemishes just like everyone else in the world…and it took me forever to find a product that worked really fast to get rid of these horrible things! I have tested everything from drugstore products to high-end, high-priced Spot Treatments. 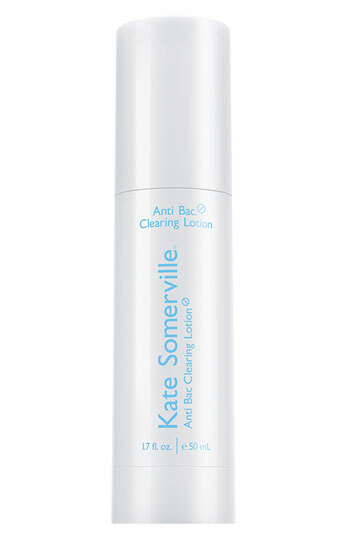 After years of testing I have finally found one that is AMAZING…Kate Somerville Anti Bac Clearing Lotion ($39 www.katesomerville.com). Anti Bac’s actual directed us is as an “all over” clearing lotion, but it is the perfect spot treatment! It contains 5% Benzoyl Peroxide which will help clear up the acne and the additional ingredients help prevent water loss and maintain moisture in the skin. The best part is that it absorbs nicely so you can wear it under makeup and it does not have any odor. You can also apply it to the chest or back if you are having breakout issues in these areas as well. Benzoyl Peroxide can be drying to my skin and cause some redness so I use this product at night with a soothing moisturizer, Creme de La Mer Moisturizing Cream ($135-$250 www.cremedelamer.com). Do not apply this lotion all over your face unless you truly suffer from Acne. One blemish here and there is not Acne, that would be classified as a breakout. If you apply Acne products all over your skin and you truly do not have Acne, you may actually be causing more breakouts because you are drying your skin out which is leading your skin to produce more oil. I know, this can all get confusing, but just treat the spots and nothing else unless you truly have Acne, trust me I am guilty of over-treating, it is hard not to do. The other great thing is that this product will last you a very LONG time. You will use just a small amount on each spot and the bottle is a very nice size so you won’t be constantly replacing this product. Please give this a try, I know you will be amazed at how fast your blemishes begin to disappear!! The Magic Wand…Every Girl Should Have One! First things first we must start with the basics…that means getting the surface clean! I have been using the Clarisonic Skin Care Face & Body System (Clarisonic.com) for about a year now. Let me tell you, this brush is AMAZING!! I was skeptical at first that this was one of those products that was over priced and really wouldn’t do anything for me…I was wrong! It is so easy to use…first you apply a small amount of your favorite cleanser to the brush, then you pick your favority speed setting and press start. The brush will work for 20 seconds on your forehead, beep, then you move to your nose and chin for 20 seconds, beep, then move to the right cheek for 10 seconds, beep, then to the left cheek 10 seconds, and then it shuts off. It is so simple and it only takes 60 seconds. Everyone has the time to do it! After using you will notice that the texture of your skin has improved, it helps clear blemished skin, helps improve the results of your other skin care products by 61% and it is also said to help with fine lines and wrinkles which is a war we are all fighting! After using you will feel that your skin feels “cleaner” and that your products are penetrating the skin better. There are three options you can choose from, the Clarisonic Mia ($119 Nordstrom.com) which is for the face only and comes with one speed and is a great travel companion! The Classic Clarisonic Skin Care System ($195 Nordstrom.com) is for the face only but has 2 speeds. I recommend getting the Clarisonic Face & Body System ($225 Nordstrom.com). The body brush is wonderful! You can put your favorite exfoliating scrub (Kate Somerville ExfoliKate Body $65 katesomerville.com) on it and it will make your legs and arms sooo smooth! The body brush apparently helps fight cellulite…that is what sold me!! I use both the face and body brush in the shower since the Clarisonic is waterproof. I do not use the body brush on my chest or decolletage (breast area), the skin there is very fine so I use the face brush on those areas which is what the handbook recommends. It has an easy rechargeable dock that also acts as perfect storage. You don’t have to use the Clarisonic face wash and body wash with the brush, you can use your favorite products. The best part is that it comes in a wonderful assortment of colors!! 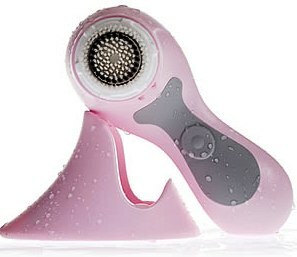 So, if you still need to send Santa your Christmas list…put the Clarisonic on it!